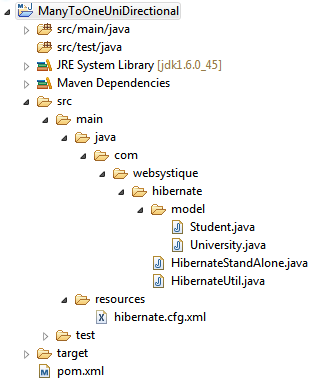 In this tutorial, we will learn about how to use Hibernate Many-To-One Unidirectional mapping using annotation based configuration. In Many-To-One Unidirectional mapping, one table has a foreign key column that references the primary key of associated table.By Unidirectional relationship means only one side navigation is possible (STUDENT to UNIVERSITY in this example). University class is a simple pojo with no information of Student class. Student class on the other hand contains an ManyToOne association to University class. @ManyToOne indicates that Many student tuples can refer to one University tuple. Also note that we have provided optional=false means this relationship becomes mandatory , no student row can be saved without a university tuple reference. 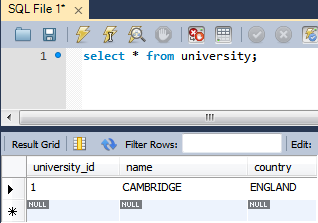 @JoinColumn says that there is a column UNIVERSITY_ID in Student table which will refer(foreign key) to primary key of the University table. 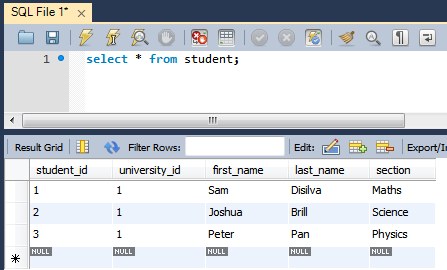 In this example only Student to University entity navigation is possible. Not viceversa. In practice, however, you are free to use query language to find all the student for a given university. Here we have persisted University class firstly in order to meet foreign key constraint(not null), then we have set student’s address property followed by persisting student.